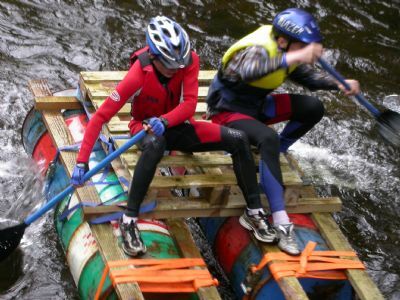 The first raft race was held in 2004 so the 2011 event to be held on Saturday 2 July will be the 8th event. 7 of these took place on the river, with just one on Loch Eck due to low water levels. River level permitting, the race will start just north of the bridge over the Eachaig at Benmore Gardens and will finish at the footbridge at Uig Hall. Its a fun event, rafts can be individual or team, construction can be of any material that is not originally designed to move on water. Safety is provided by Benmore Centre Staff and their decision on any safety matter is final. You will see from the pictures that this is an exciting and colourful event for both the participants and the spectators. On completion of the race there will be a BBQ and music courtesy of Dunoon Community Radio. The other attractions at the hall include a bouncy castle, tombola, licensed bar, book stall and an opportunity to view on film previous raft races. In the evening there will be a ceilidh dance with the popular local band Canned Haggis. So come along and enjoy the fun!